One of the things I love the most about having a new book published is seeing how the imagination of readers makes it come alive. 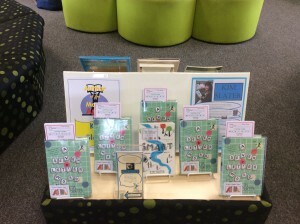 It’s wonderful to get great reader reviews and comments of course but I’m also talking about school and library initiatives and imaginative book shop displays. Here are a few examples of those that have caught my eye so far . 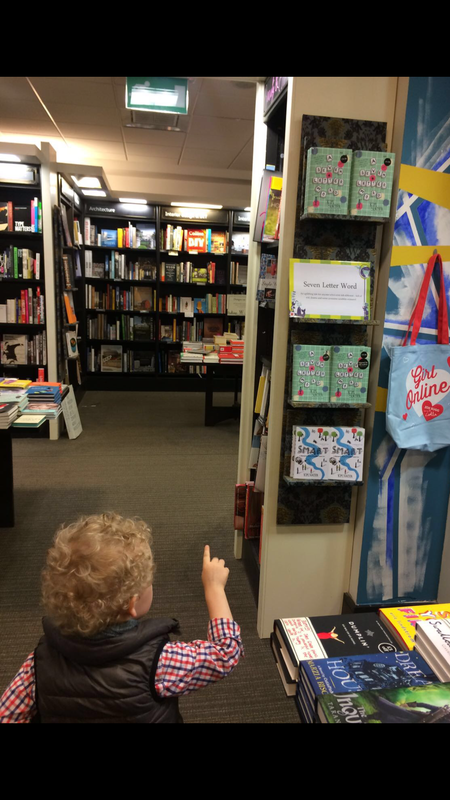 . .
My 3-year-old nephew Lukasz has appointed himself official ‘spotter’ at our local branch of Waterstones. 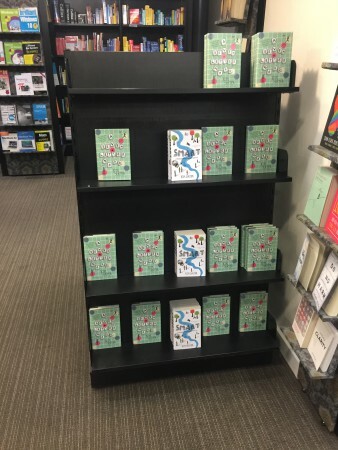 They did a brilliant job of hosting my book launch events for both ‘Smart’ and ‘A Seven-Letter Word’ and consistently surprise with their innovative book displays. 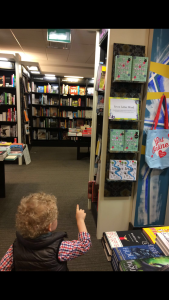 Lukey is vigilant in spotting new displays of Auntie Kim’s books and takes particular care to inspect all is as it should be within the covers! 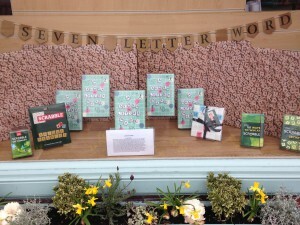 I’m pleased to confirm that so far, Lukasz has awarded Waterstones top marks! I’ve shown this pic before but it’s such a gorgeous display it deserves another airing. It features unique ‘Seven-Letter’ themed bunting and an eyecatching backdrop of Scrabble letters. The colours of the cover compliment the spring flowers perfectly. 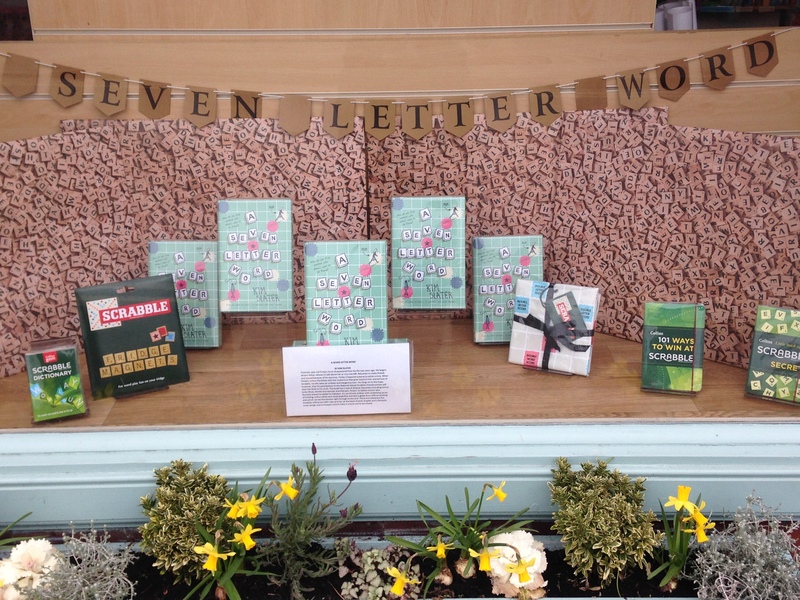 Owner Jane has even installed a mini-Scrabble board in the shop to invite readers to engage with the game. Bingo! The Bookcase is a wonderful independent book shop with lovely, knowledgeable staff . . . well worth a visit. Some of the school initiatives have also been fantastic. At Toot Hill School in Bingham, I have enjoyed the privilege of being their ‘Author of the Month’ for April. The Learning Lounge’s fab ‘Author of the Month’ display for April! The LRC Manager Mrs Litherland and library assistant Ms Marris do a wonderful job in the Learning Lounge where they organise events and activities to get students engaged with reading. 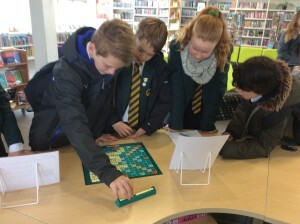 This included a Learning Lounge mystery challenge connected to ‘A Seven-Letter Word’ which students completed to earn 25 credit points and a LL goody bag. 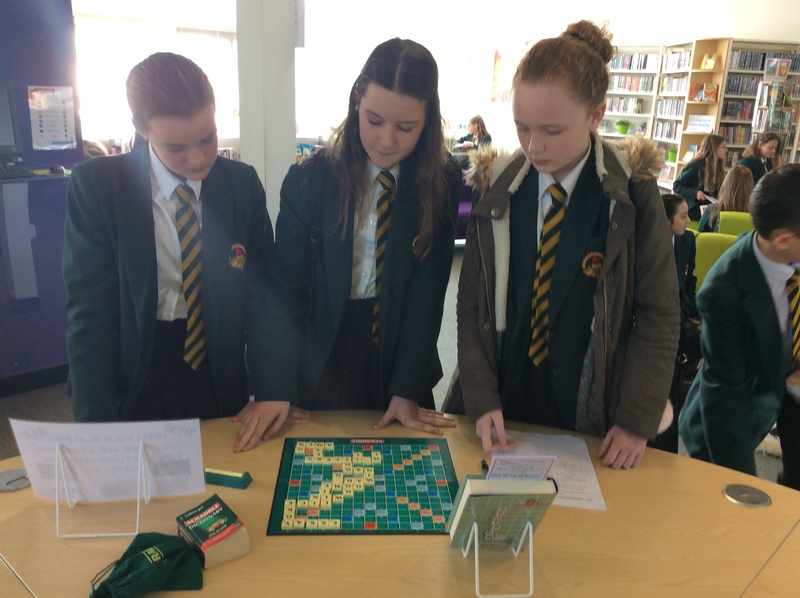 Mrs Litherland and Ms Marris also had a Scrabble game up and running which created lots of interest. 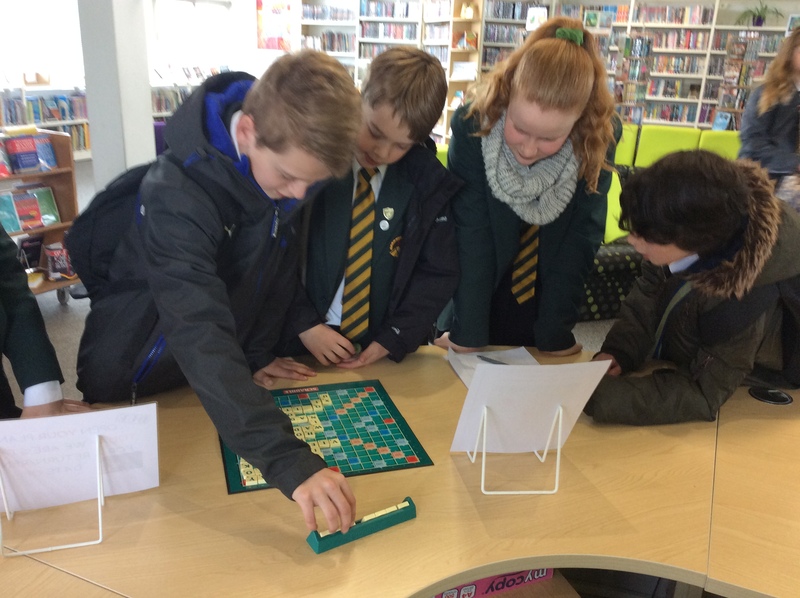 ‘We were surprised at how many students had never played the game,’ Ms Marris told me. 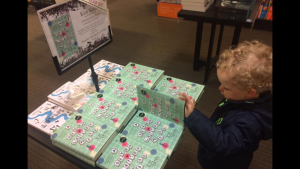 It’s great to think they’ve found a new game to enjoy through reading the book! 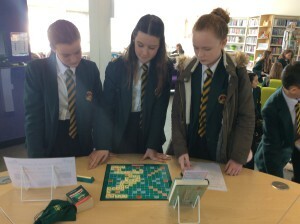 The students try their hand at Scrabble in Toot Hill’s School Learning Lounge. I am so looking forward to meeting the Learning Lounge readers when I visit Toot Hill School in July. Dr Haslett runs the very capable Literacy group at Castle Hill Primary School in Chessington. I was lucky enough to see a sneak preview of his literacy resources cupboard. I’m sharing it with you here . . . Seeing Dr Haslett’s literacy resources cupboard made my heart sing! 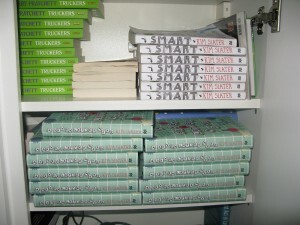 I really enjoyed taking part in a Skype author Q&A session when Dr Haslett’s group studied ‘Smart’ last year. The students had such great questions that really put me on the spot and made me think! I’m really looking forward to doing something similar with Dr Haslett’s group again this year. I never fail to be amazed how committed school and library staff are and how they make reading come alive for their students. 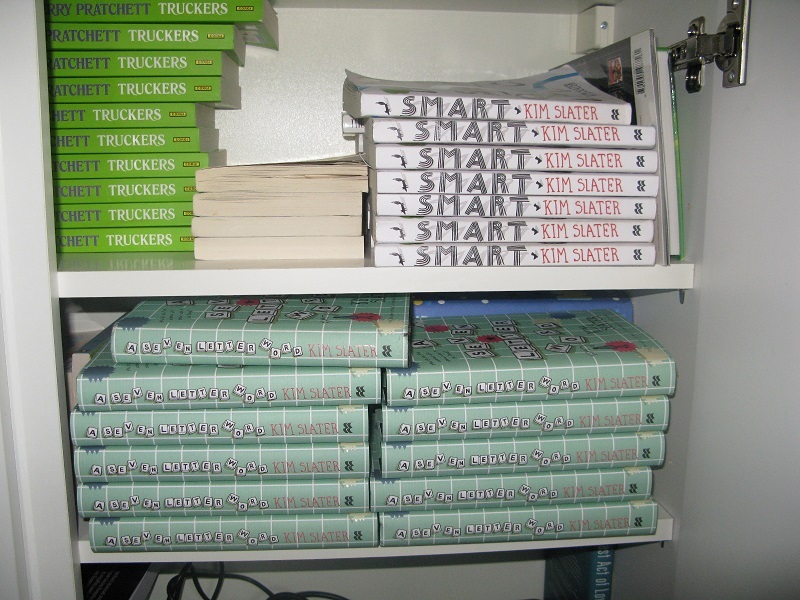 How lucky those young readers are to have them and how lucky I am as an author to see my book in their hands! Please do let me know if you’re taking part in or know of any similar ‘Smart’ or ‘Seven-Letter’ initiatives happening in schools and libraries.